"Saving our history of yesterday for the next generation of tomorrow." This page is under construction... check back often for new updates and content. 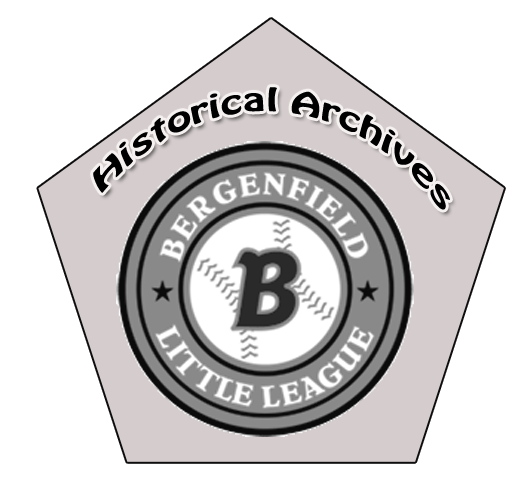 Do you have old newspaper clippings, photos, printed material and artifacts from Bergenfield Little League? You can help us build our Historical Archive website page! Please contact us @ webmaster@bergenfieldlittleleague.org! We need your help in preserving our league’s 62 year history! 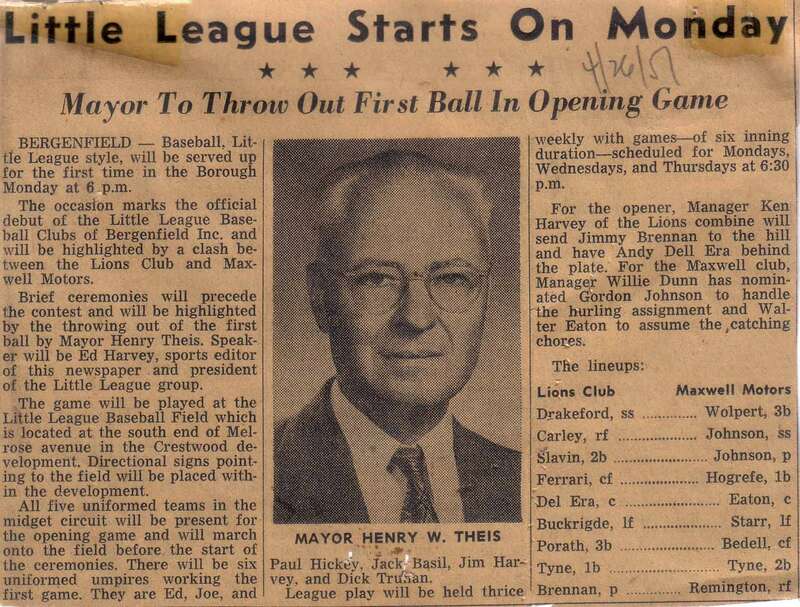 Official Debut of Little League Baseball Club of Bergenfield Inc.
Monday, April 30, 1951 6:00 P.M.
Mayor Henry Theis throws out the first ball. Melvin Drakeford of the Lions Club running home, Gordon Johnson of Maxwell Motors waiting for the throw. This year is dedicated to all the members, managers, coaches, umpires, the boys who played for them and to all the wives and mothers who rearranged mealtime schedules and, in general, supported the teams. 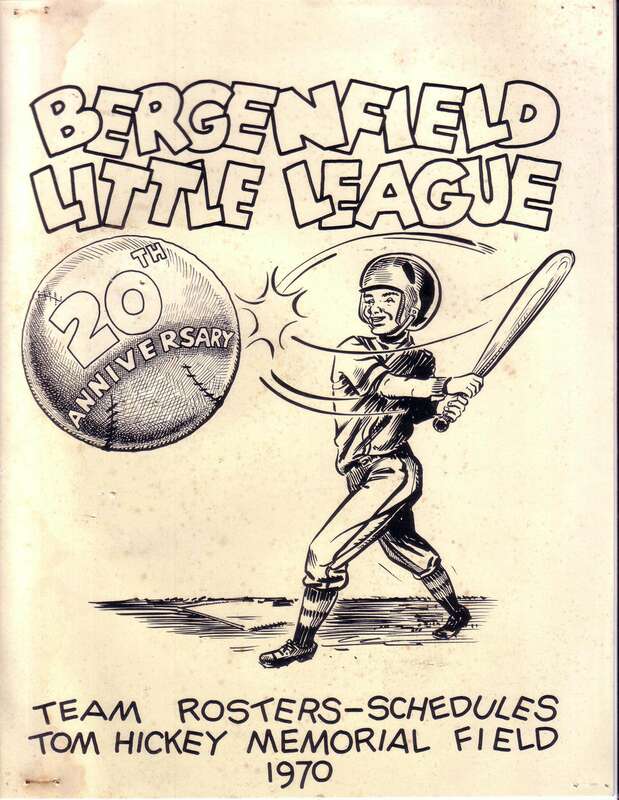 Ironically, the idea for a Little League in Bergenfield originated not with a man, but with a woman. Alice Harvey read a magazine article about Little League in the Summer of 1950 and mentioned it to her husband Ed. 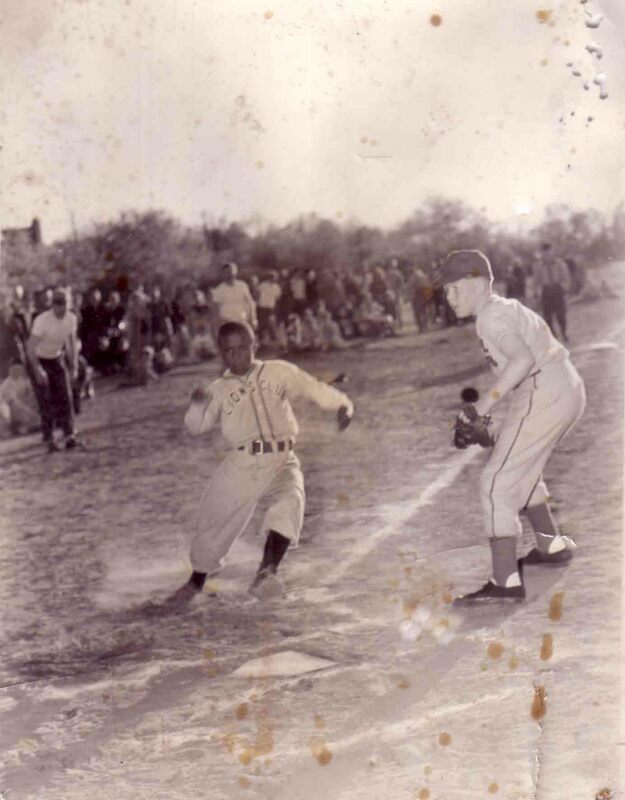 Interested in a program of this type for youngsters, Ed wrote to Williamsport, Pa., and received an answer from Carl E. Stolz, who founded Little League baseball in 1939. 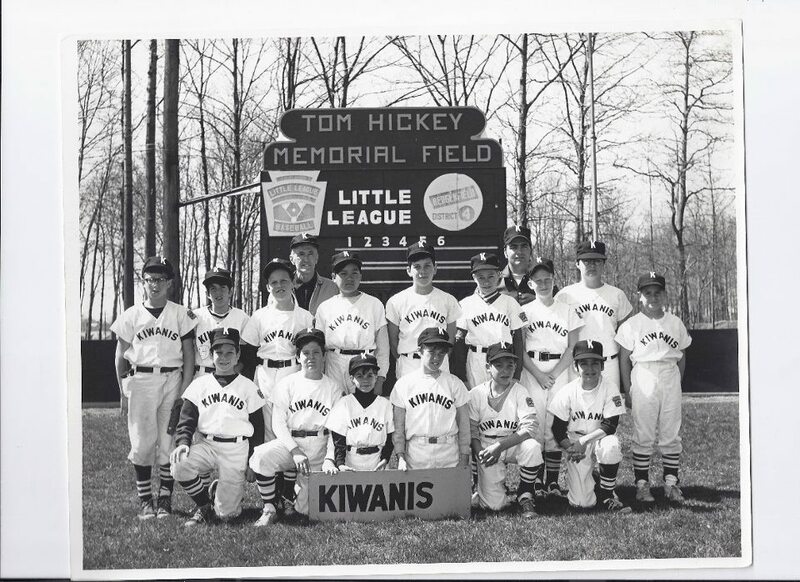 Subsequently they met in Cresskill to discuss the principles and format of Little League. Ed then spoke to Mr. Maxwell of Maxwell Motors who agreed to become the first team sponsor. After contacting the various clubs and service organizations in town, the Lions Club, Rotary Club, the V.F.W. Post # 6467 and Bergen Motors also agreed to sponsor teams. Now the boys needed a place to play ball. Notified about the problem by the league's commissioners Ed Sheridan, Carman Leggiere, and Ed Harvey, the Mayor and Council provided a section of property at the end of Melrose Avenue. 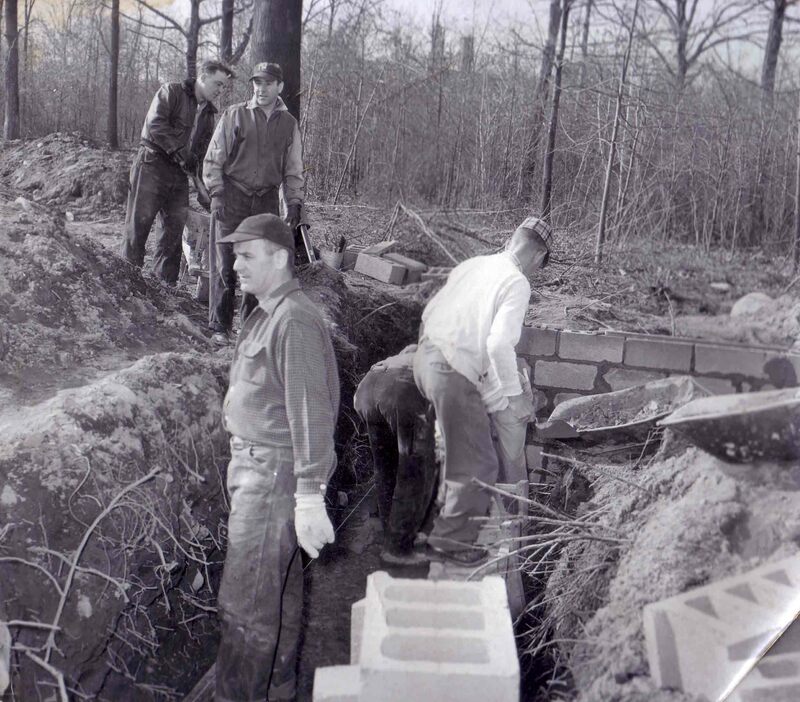 Through the cooperation and dedication of more than thirty men and women throughout our town, the area was cleared and the building of the field began. 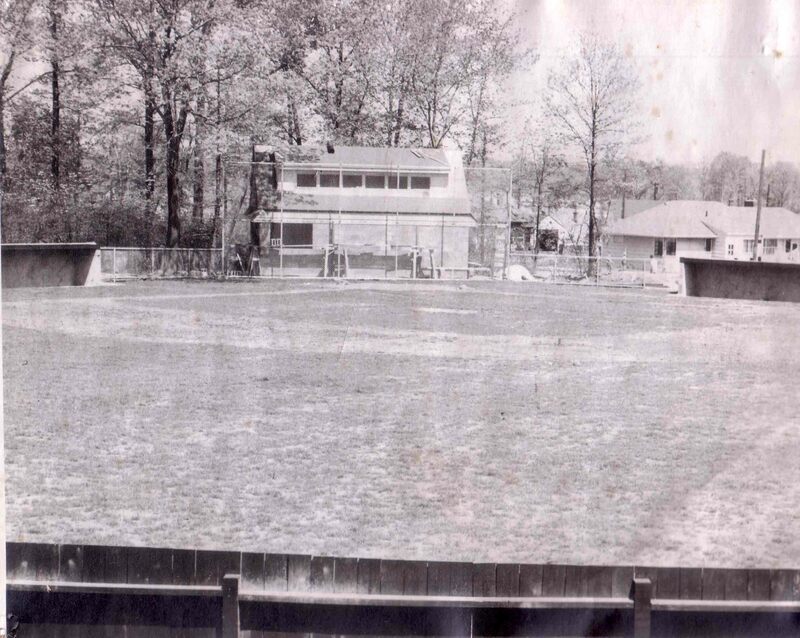 The field was not ready for opening day and so the first few games had to be played at Prospect Avenue, at the present site of the High School. At the first game Mayor Henry W. Theis threw out the ball and watched as the Lions Club beat Maxwell Motors 11-1 in a five inning game that had to be called because of darkness. A week later the field was ready to play on, but a constant fight against the elements ensued. The absence of grass caused problems of soil erosion and rocks, making it a difficult field on which to play. 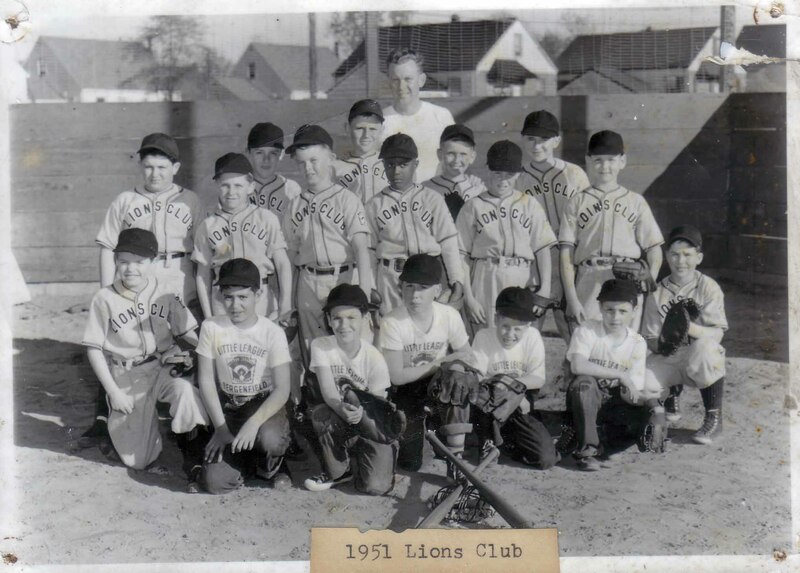 In 1952 the Elks Lodge #1477 joined Little League bringing the total to six teams. The first all wood fence was installed replacing the chicken wire one that was temporarily set up. A concession stand was opened so that the women's organization could sell refreshments to the fans. The High School loaned them a small section of bleachers and Bergenfield Little League was recognized as a Bergenfield youth program. 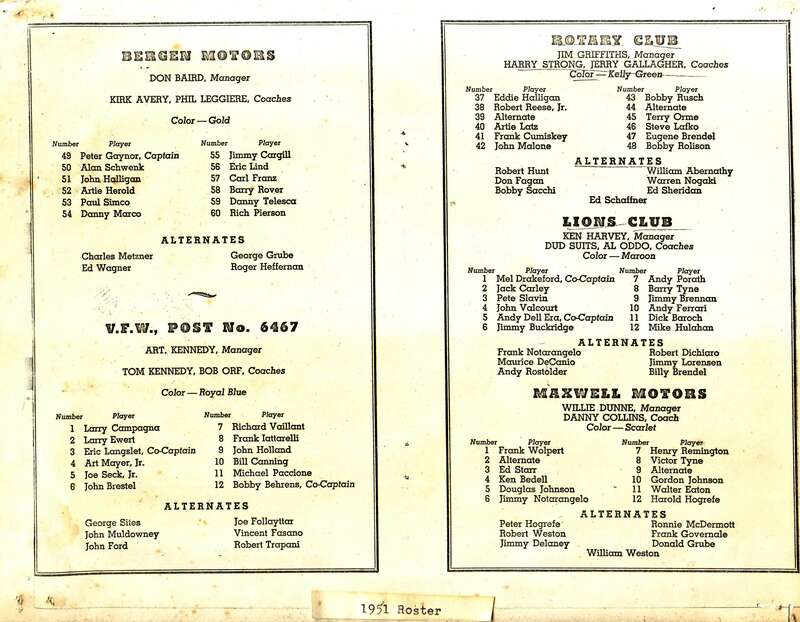 In 1953 two more teams were added and the league split into two divisions. The American League consisted of the Elks Lodge, Rotary Club, Bergen Motors and Vautin-Shaffner. The National League consisted of the Lions Club, V.F.W. #6467, Guerra’s and Manor Petroleum. Since there were two divisions a two-out-of-three play-off series was initiated to decide the town champion. It was decided that the winner would be awarded the Mayor's trophy at the League's Annual Picnic in September. In 1955 the League then moved to its present site and the field was dedicated by Mrs. Yogi Berra. Lights were installed four years later in 1959. During that same year two more teams were added to each League raising the total to twelve teams. The new additions were Kiwanis Club, Florence Shop, Chamber of Commerce and B&H Supply. In 1961 the All Star State Finals were held here on August 11th and 12th. A crowd of approximately 5,000, including the Mayors of the competing towns, turned out to watch River Edge play Livingston and Sayreville play Margate City. In the final game Sayerville defeated River Edge by a score of 9-3. For the occasion a new street sign was installed at New Bridge Road and Wildrose Avenue appropriately named Little League Drive. In 1962 it was decided to add a farm system which would be called the Minor League or International League for boys from 8-10 years of age only. Prior to this, the age group of the boys on the same team was from 8-12 years. 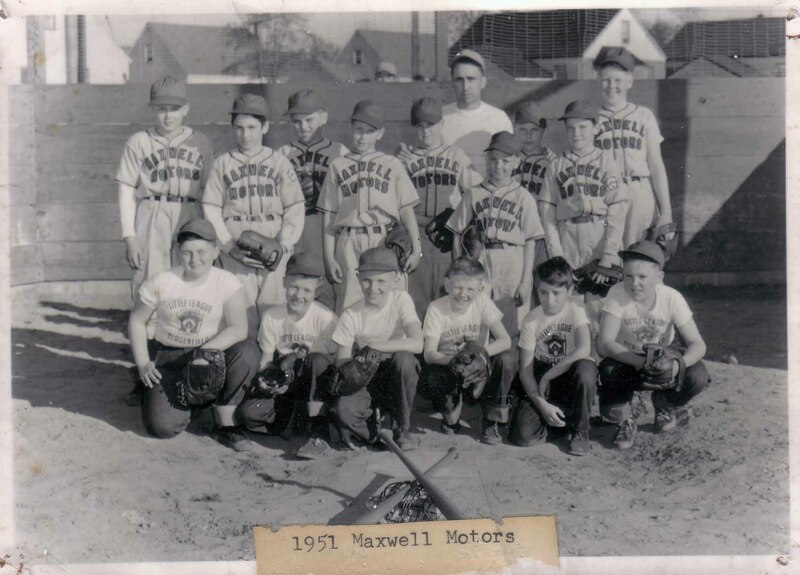 The new system was designed so that the younger boys could play more often in a league of their own and thus benefit from the added experience. Another purpose of the minor league is to be an additional source of players for the major league teams during and at the end of each season. Under the direc¬tion of John Turck (our present District #4 Representative), the league began with four teams. The new sponsors were Liss, Garrison, Luhmann's and Mack's Auto. In 1963 two more teams were added to the league which brought the number of teams to eighteen which is our present size. Future plans are now in progress to expand Bergenfield Little League. The upper field is being readied for play beginning with the 1970-71 season. A three year plan presently under study could gradually en¬large the major leagues to a three five-team system with a minor league of from eight to nine teams. Each year since our beginning fifteen boys have been selected from each league to represent Bergenfield on an All Star Team. 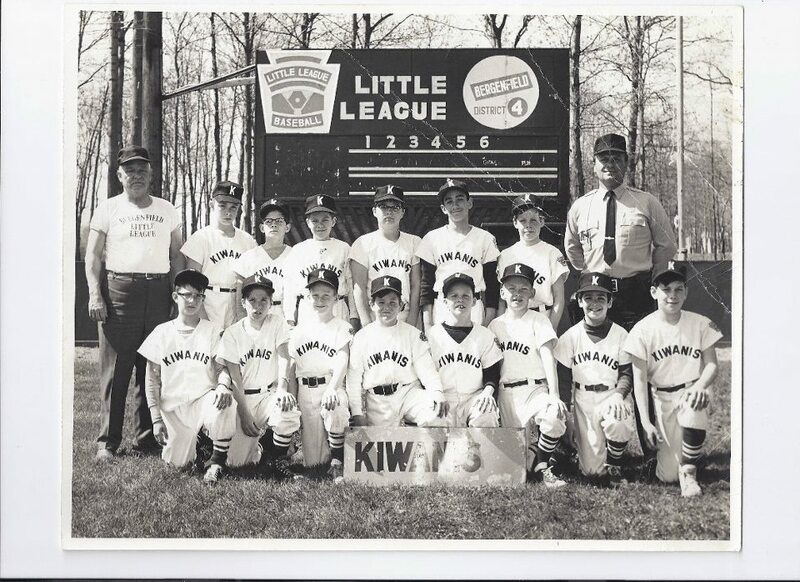 The dream of every boy who plays Little League is to go to Williamsport, Pa., the site of the World Series of Little League since 1948. It has served to climax a period of tournament play and to close out the activities of the season. Tournament play is optional, but a majority of Little Leagues take part. To evolve a World Series field of eight regional teams requires about three weeks’ time from the start of tournament play. Teams progress through district, sectional, state and regional games in the single elimination play. 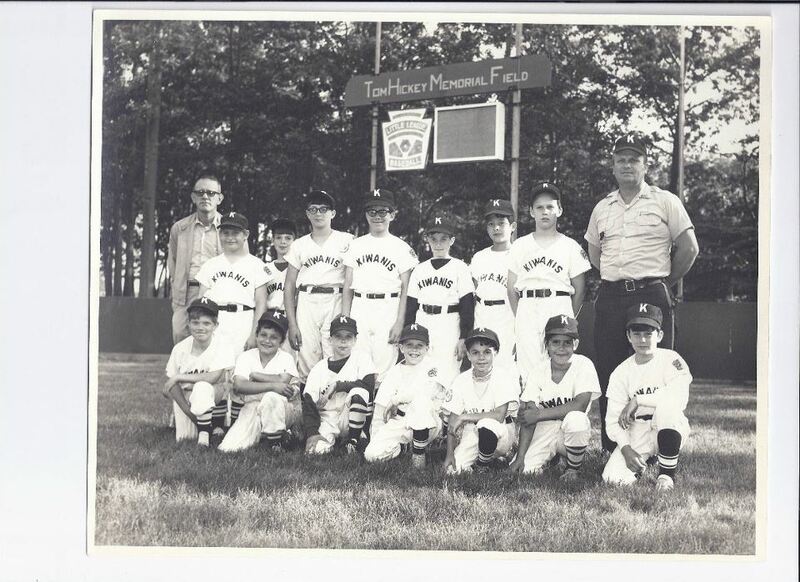 In 1967 the American League All Stars advanced to the State Finals at Toms River, and in 1968 the National League All Stars went on to the finals at Pitman, New Jersey. Regardless of how far our All Star Teams progress in the competition, the experience is remembered by the boys for the rest of their lives. This year we are hosting the District and Sectional play offs at the end of July. The success of our first twenty years can be attributed to the members of the men's and women's organizations who devote countless volunteer hours to supporting the league's activities. 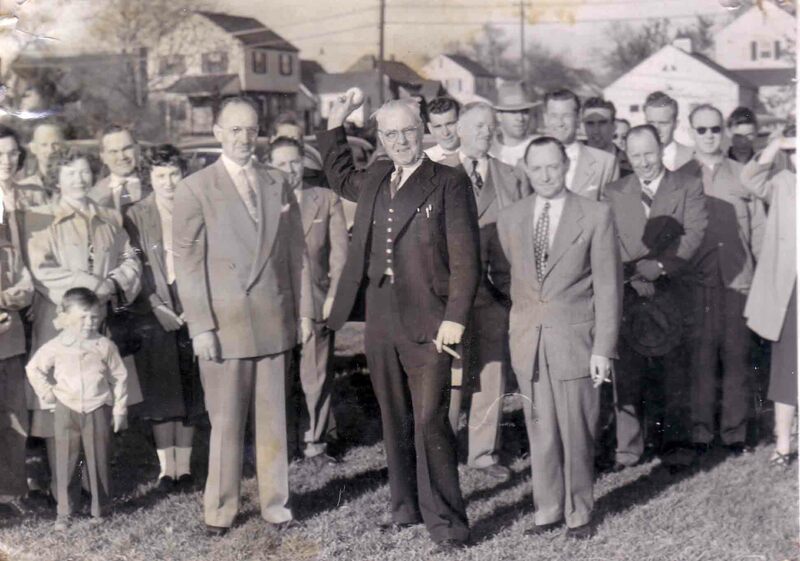 The men's organization began first with a few men meeting at the Home Place Fire House and its membership has steadily increased over the years. Their organization is composed of managers, coaches, umpires and other people who have a common interest in boys and baseball. They meet the first Monday of each month at the Bergenfield Recreation Center. Membership is open to any interested person who would like to become involved in our activities. In addition to baseball the men maintain the playing areas, hold two dances a year, and run a family picnic at the end of the season. The purpose of the women's auxiliary is to augment manpower and supplement the league financially through their various activities such as the concession stand and card parties. Membership is open to any women having an interest in Little League and all mothers of sons in Little League are automatically members. During the course of the season every mother is called upon to help out in the operation of the concession stand. Meetings are held the fourth Wednesday of each month, except November and December, in the Civic Room of the Borough Hall. Good Luck and Congratulations to all the wonderful men and women of Little League! "It is with deep regret that we acknowledge the passing of Tom Hickey on December 25, 1969. 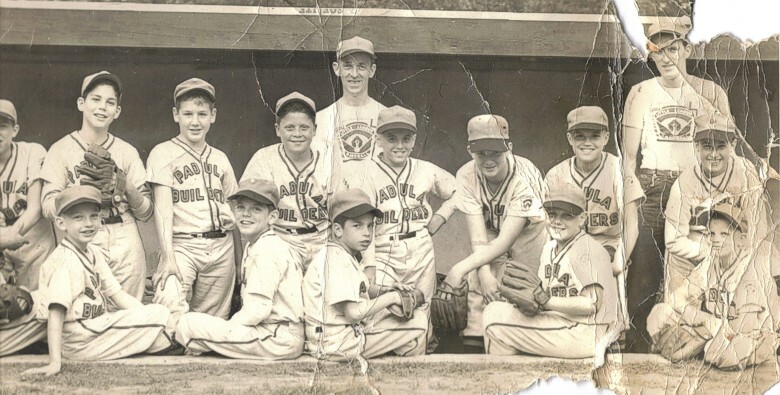 Tom was an active participant in Bergenfield Little League as a manager, coach, and umpire for many years. His qualities of loyality and leadership were well known and will be missed. We are proud that the Little League field will be named in his honor as a lasting memorial of his service in the organization." 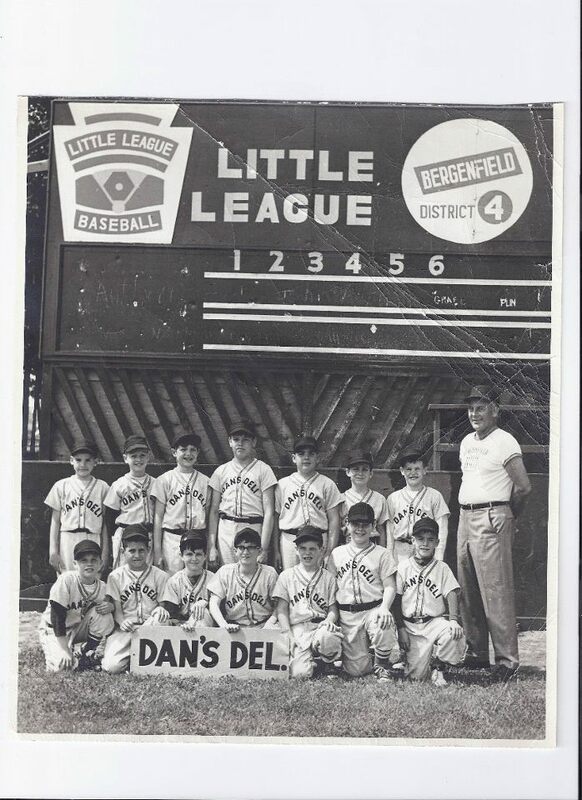 Please send us your favorite flashback team photos of Bergenfield Little League. 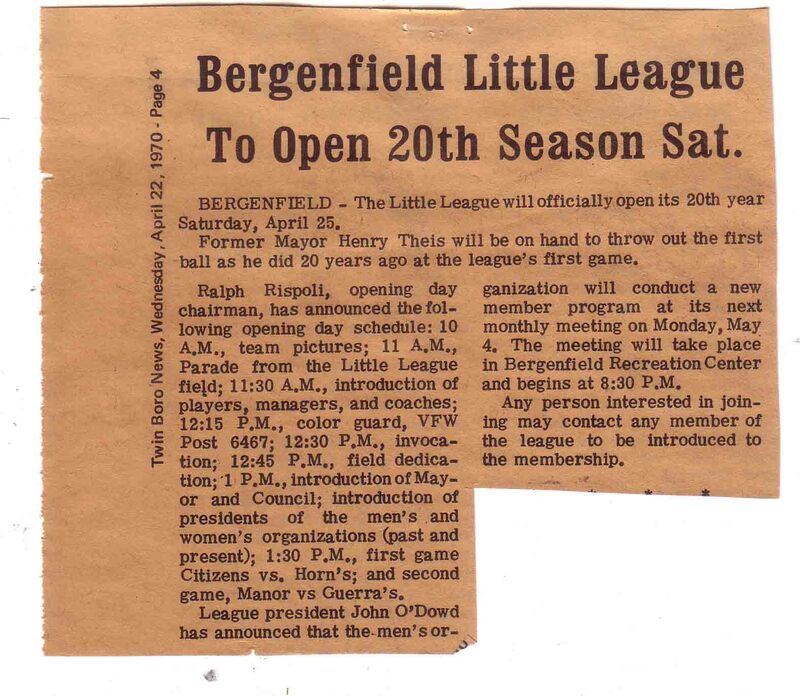 We will add it to our Web Archive Page @ www.bergenfieldlittleleague.org. We will also post a different photo on FB weekly for our fans to like, comment and tag! Email your photos to webmaster@bergenfieldlittleleague.org and include the date and any relevant info.